We have been employing the same investment strategy in dedicated High Yield portfolios through multiple business cycles since 1998, and since 1994 in a cross-over portfolio. We are active managers. We do not circle around an index, making minor tweaks to industry weightings. There are several industries where our portfolio is very underweight or has no representation at all because their cyclical nature makes high leverage inappropriate, or because the industry is in long-term secular decline. We are more focused than most managers, historically holding not much more than 100 issuers in the portfolio. Our turnover ratio tends to be lower than average, since our strategy leads us to longer time horizons in our investments. Our strategy/philosophy consists of three prongs: The Core, Out-of-Favor, and Small Cap. We build a core portfolio around long-term secular trends. Some examples of these are demographics, technology, globalization, regulatory trends, and fiscal and monetary policy. Alignment with these trends can give companies the support of a strong tailwind. This, in combination with our industry focus, leads to a more robust portfolio. In analyzing a company we first seek to gain an understanding of the industry and its long-term trends. Our experience is that this constitutes more than half of the investment process. Most often it boils down to the basic question of Econ 101: Are supply and demand in balance? If not, what will bring them into balance? We analyze companies as a good CFO would, making sure there is adequate return on capital, cash flow, and liquidity, and that the company reinvests enough to sustain the business. 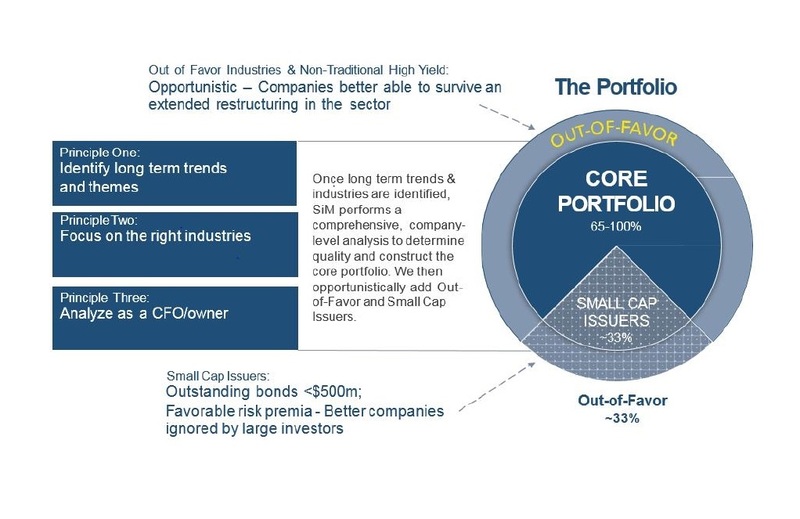 We supplement the core portfolio first by investing in out-of-favor sectors. Not simply contrarians, we invest in out-of-favor sectors that have long-term viability and where our industry analysis tells us that supply and demand are on a path to rebalancing, usually through a cleansing of excess supply. That rebalancing can take two or more years, so analyzing companies as a CFO is important in identifying the survivors. The great thing about high yield bonds, as opposed to stock, is that you can get rewarded by collecting high interest income while the industry turnaround works itself out. We have also taken advantage of non-traditional high yield securities that have fallen out of favor. Some examples of these are Emerging Market debt, convertible bonds, preferreds, and REITs. These sectors have select groups of natural buyers that periodically abandon them. When these sectors of the capital market lose their natural buyers, their yields can become very competitive to high yield. The advantage of these sectors is that they not only offer competitive yields, but their lower correlation to traditional high yield serves to reduce overall risk of the portfolio. The market is always volatile enough and provides opportunities to invest in out of favor areas, it’s just the matter of waiting and letting the market tell you where to look. Historically, we have had about one third of the portfolio in out of favor areas. We will typically invest about one third of the portfolio in “small cap’ companies. We define small cap as companies with $500mm or less in bonds outstanding. We believe over a complete cycle, apples to apples, 100bps extra is earned in small cap companies. The reason this exists is due to rating agencies penalizing small companies (at a minimum 20% of the rating is the size of the company) and large investors ignore these companies because they cannot invest in enough of the company to make a difference to their portfolio. We wait for out-of-favor opportunities to present themselves to us and screen them for viable investments. Towards the end of the business cycle investors chase every bit of extra yield they can find and very little tends to be out-of-favor. In that environment the lack of opportunities “forces” us back into our core portfolio. Late in the cycle yield spreads are tight overall, thus minimizing the cost of being in that more conservative, less cyclical portfolio. With our “horns pulled in”, we tend to be better situated for a downturn and for the out-of-favor opportunities that will arise from it.